Delta Invest is a new site claiming to give Bitcoin investors a platform to be able to participate in a High Yield Investment Program (HYIP) and earn percentage profits on their invested Bitcoins. The biggest question is, is Delta Invest real or is it just one among the many scam projects all over the internet? We have tried to collect as much evidence as possible to help many people thinking of getting rich quick. Below is our informative review and conclusion regarding Delta Invest. We are confident that the review contains all the answers to any questions you may have about the Delta Invest scam. With reference to DeltaInvest.net, Delta Invest is an investment company established by professional traders in the fields of real estate, stock trading and cryptocurrency trading. The site’s primary function is to receive funds (in BTC) from investors and trade them in profitable markets, particularly the altcoin market. The site also enables you to earn regular dividends from owning and trading Omicron (OMC) currency. Omicron is basically a new generation digital currency that gives periodic returns, just like stocks. Delta Invest introduced this currency to widen their pool of funds and consequently, their profit margins. Delta Invest requires you to purchase at least 10,000 OMC to qualify for their bi-weekly returns. These can be purchased using ordinary cash or Bitcoin. Basically, 1 OMC represents 0.00001% of total revenue to be paid. The site is however not clear on the exact rates of returns investors should expect on BTC and only puts it as ‘above’ 3.5% per day. It might look a bit negligible, but 3.5% daily returns are quite significant especially if you have invested a large amount of money. But then again, when you are dealing with a scam like Delta Invest, it is proportionally a large amount of money to lose just like that. In instances where you have referred someone, the site awards you a one-off commission of 10% of their investment. This is a very calculated move on Delts Invest’s side. As you aim to earn more you will end up referring more of your friends and even relatives, probably even referring yourself and opening several new accounts under different names, not knowing well that you are financially draining yourself and destroying your reputation among your friends. Because, guess who your friends won’t be talking to when they get scammed? Right! Delta Invest also tries to lure people into investing big using several motivational strategies. First is a monthly award program called Top Investors which seeks to acknowledge and reward the people who invest the most. The top 10 investors in a month receive cash bonuses of between 1-25%, depending on investment. This pushes people to invest more with them. To add icing to the cake, they claim to have insurance schemes for their members, ‘just in case’. However, details of these schemes remain as vague as the future, which makes it hard to believe anything. The truth is, the whole concept that Delta Invest is built on does not inspire confidence. Worse still, the site makes some clear blunders in presentation and public relations that further decimates the little trust one might be having. To begin with, the profit margins are way out of the ordinary money markets and you will all agree, if it were that way, we all would be very rich. It’s the quickest route to richness as all you need is to invest some amount of money, then sit back and wait for your bi-weekly returns. Also, the fact that the profits are calculated on a daily basis only proves that either the team behind the site don’t even know how financial markets operate or are aware and only want to troll us, and possibly get the naive ones among us. The truth is, no one, absolutely no one, makes profits on a daily basis in any form of business, leave alone financial trading. Only Ponzi schemes and HYIPs will try to convince you otherwise. Secondly, they give you assurance of continuous rising and not falling of the value of your investment, disregarding unprecedented events which might affect the financial markets. Apparently, inflation and other factors surrounding the currency and investment world do not affect the site’s so called expert traders. That’s too good to be true. Or probably not true at all. Lastly, the website has very little details about the company and the owners as well. You will have to go through a lot of trouble to even know how you will make your first profit. There is also no clear indication of what they do as far as investments are concerned, how they sustain them, and even the names of affiliates and partners. Good luck in finding the ACTUAL physical address of the company’s offices. Luckily, there are not many people who have heard about, or actually used Delta Invest. Nonetheless, a few people took the risk and tried out the untried and unproven HYIP and were seemingly not afraid to make their opinions known. In Delta Invest website, out of seven reviews, 4 are in the “good” category and 3 are quite negative. This gives the site an average rating of 3.6 out of 5 stars. That translates to almost a 50/50 rating, meaning the good and bad cancel out hence a zero advantage of investing in the program. The bad reviews are all about delays in withdrawals processing and lack of response from the customer care team when needed. One specific client claims to have been coned $25 and swears that Delta Invest is devil-sent. Another one complains of having his account frozen for more than 3 days, within which he couldn’t make any withdrawals. We know that you love and treasure your money and peace of mind and you do not want to invest in a HYIP with such poor ratings. To summarize, Delta Invest is a fraud and no amount of false advertising can change that. This is a site who’s core businesses remains unknown even to the people who invest in it. The owners too keep their identities, and those of their staff, under wraps. This is definitely not a good sign, especially for a website soliciting for money from the public. 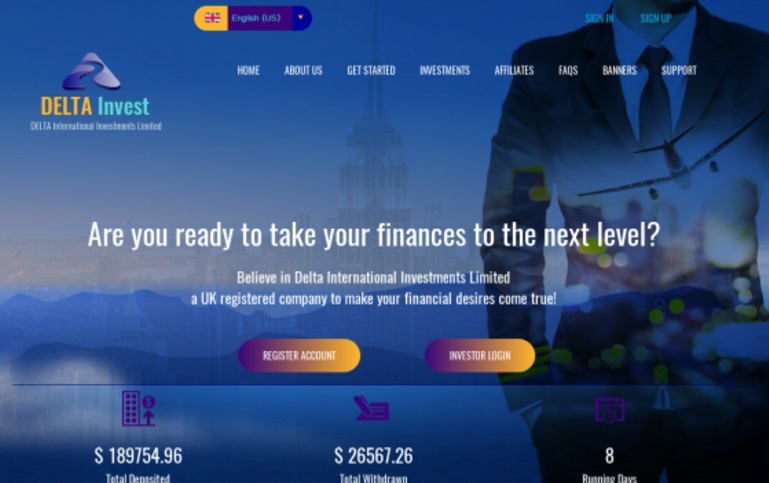 We find it hard to trust the Delta Invest scam and would advise you to keep off until it is proven beyond reasonable doubt that the site is actually real. But as you know, that is next to impossible as thieves never change. We generally recommend being extra careful when you are doing any financial transactions with people and/or groups of people who you do not know that well, particularly websites which require you to put up your money. These are people who will disappear with your money and come to think of it, you would have nothing at all to prove your claims. All you can do is lament and caution your close friends and relatives, by which time it will be too late since your money will have found a home in these people’s pockets. Do not allow yourself to become a static, or your money to pay for someone else’s lifestyle. Invest wisely. Verdit: Delta Invest is a SCAM! If you have been scammed by Delta Invest, please tell your story in a comment below. You’re also welcome to contact us if you would like to consult with us about your bitcoin investment strategy. We may also be able to help you recover lost funds in case you have been scammed.